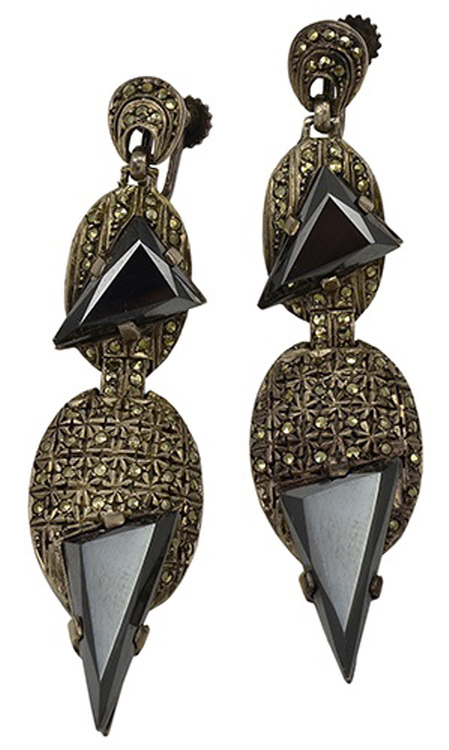 Art Deco Sterling Silver Marcasite Hematite Earrings by Theodor Fahrner. These screw-back earrings are 2.375 inches long . These Art Deco earrings were made in Germany and have impressed marks for Theodor Fahrner 935 (Sterling mark) Circa 1920s. Theodor Fahrner's work is illustrated in several books including 'Theodor Fahrner Between Avantgarde and Tradition and Jewels of Fantasy'.